We’d love your help. 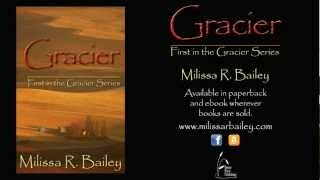 Let us know what’s wrong with this preview of Gracier by Milissa R. Bailey. To ask other readers questions about Gracier, please sign up. Gracier brings small town Iowa to life. I hope there are still towns out there like that. If so, I want to move there. The book is beautifully written as everything is meticulously described in lovely language. Unfortunately, that flowery prose also slowed the book down a lot. It often came in the middle of some other event or character's internal monologue and I frequently wanted to rush it along to get back to the meat of the problem. About half way through chapter two I decided I knew where t Gracier brings small town Iowa to life. I hope there are still towns out there like that. If so, I want to move there. The book is beautifully written as everything is meticulously described in lovely language. Unfortunately, that flowery prose also slowed the book down a lot. It often came in the middle of some other event or character's internal monologue and I frequently wanted to rush it along to get back to the meat of the problem. About half way through chapter two I decided I knew where this book was heading and for a long time it looked like I was right. Then there was a twist (making me only half right). For the last couple chapters there was enough occlusion for me to wonder if the book was going to stay the new course or return to the old, so in that sense it maintained enough of a mystery to keep if from being completely predictable. For the most part I really enjoyed it, but I can't say I liked all of it. The basic premise is that Jessica returns home for her grandfather's funeral and is forced to face someone from her past that she would rather forget. It soon becomes obvious that everyone around her is hiding something and she sets out to find out what. This is all well and good, but despite the whole why of the secret being explained, I didn't buy it. It essentially comes down to a bunch of men deciding to keep some pertinent information from one woman. They do it for all the best reasons of course, but it's still far too paternalistic for my taste. I would have wanted the painful truth and would have a hard time forgiving anyone, let alone everyone important to me, hiding it from me. Who are they to decide what's best for someone else? It would be another matter if she was 12, but she's well into adulthood. Jessica also seems to have a whole sense of crisis about all of this before she has enough information to know that it should and would cause emotional upheaval. I understand that it was supposed to be Michael's presence that put her so on edge, but she seemed disproportionately wound up about the whole thing before having enough clues to put her there. Jessica McCabe comes home to Gracier, Iowa, to bury her grandfather, Jonas. Jonas is the man who raised her and as she lays him to rest she finds out a few things that he has kept hidden from her. The more answers she gets the more questions she has. Matthew was once Jessica’s boyfriend. They had big plans and then one day Matthew walked away. Jessica never understood and never forgave Matthew. But now he seems to be wrapped up in some o I received this book for free through Goodreads First Reads. Matthew was once Jessica’s boyfriend. They had big plans and then one day Matthew walked away. Jessica never understood and never forgave Matthew. But now he seems to be wrapped up in some of the secrets Jonas was involved in and it’s forcing Jessica and Matthew together. This book was really hard to put down. The author did an excellent job of reeling me in and getting me to want more. Everyone in this book seems to be connected to Jessica and her past and everyone has a secret. I had all sorts of theories whilst reading, fancying myself as a Nancy Drew, but every time I thought I had it figured out, another curve or clue came my way. One of the issues I had with the story was that it bounces from character to character, viewpoint to viewpoint too frequently for me. Sometimes the transition was smooth, other times I was confused as to whose thoughts I was now reading. The same thing was true with some of the dialogue. Had it not been for those problems I probably would have rated this 5 stars. Everything else was spot on. Gracier is an intriguing love story and mystery with plenty of suspense. It really was very hard to put down and I stayed up late last night to finish it! This book promises it is the first in a series and I am very eager to revisit the small town. I already feel invested and attached to the little community and its people. And if the next books are as good as this one the series will be excellent. Gracier is an intriguing romantic suspense story of long-held secrets, drama and romance set in the small town of Gracier, Iowa. Jessica McCabe returns home to Gracier to attend her grandfather Jonas McCabe's funeral. Jonas was the town's longtime beloved veterinarian, and it had been his and Jessica's dream to one day share the practice, but his sudden fatal stroke left it up to Jessica to pick up the pieces. Her homecoming brings revelations of long-held secrets that her grandfather had kept h Gracier is an intriguing romantic suspense story of long-held secrets, drama and romance set in the small town of Gracier, Iowa. Jessica McCabe returns home to Gracier to attend her grandfather Jonas McCabe's funeral. Jonas was the town's longtime beloved veterinarian, and it had been his and Jessica's dream to one day share the practice, but his sudden fatal stroke left it up to Jessica to pick up the pieces. Her homecoming brings revelations of long-held secrets that her grandfather had kept hidden from her. Determined to get to the bottom of the secrets and questions of her family's past, Jessica is forced to deal with the one man who had broken her heart, Matthew Cassidy. In the first book of The Gracier Series, author Milissa R. Bailey weaves a gripping tale of mystery, suspense and romance that easily draws the reader into Jessica's story. Told in the third person narrative, the reader is transported to the small Norman Rockwell like Midwestern farming community of Gracier, Iowa, where long-held secrets and town gossip keeps the reader riveted as the suspenseful twists and turns of the McCabe family's past unfolds. And if that isn't enough to keep you engaged, add in some unrequited love from a best friend and a painful past romantic relationship with the son of an arrogant man who was Jonas' bitter rival, and you have one heck of a page turner! With a large cast of realistic characters from a small Midwestern town, the author does a great job of bringing them to life in vivid detail and with engaging dialogues and interactions. The small town setting of Gracier is richly described, you could close your eyes and picture the sights, sounds and smells of the farms and the main street of the town and its townspeople. I loved the author's creative style of weaving together the multi-layered plot, the balance of mystery and suspense with the drama of a complicated romance kept me enthralled and guessing what would happen next. Gracier will engage you to revisit this charming small town and its townspeople as each new book in the series is released. Gracier is the story of living in a small Midwestern town where charm, drama, romance ... and even secrets do abound! 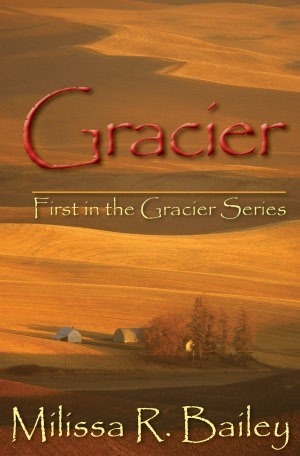 Gracier is the first book in The Gracier Series. Disclaimer: I purchased a copy of this book for the purpose of reading and providing an honest review. I am participating in a virtual book blast promo event hosted by Book Blasts and Blog Tours. Jessica McCabe returns to Gracier, a small town in Iowa, after her grandfather’s death. In addition to this tragic event, Jessica has to discover that virtually everyone has lied to her as she discovers step by step the secrets her grandfather has left her with. I absolutely loved the description of Gracier. This small town sounds truly amazing (it reminded me a lot of the life in Stars Hollow from Gilmore Girls). Milissa created such a lovely and adorable setting for her novel. I loved this tigh Jessica McCabe returns to Gracier, a small town in Iowa, after her grandfather’s death. In addition to this tragic event, Jessica has to discover that virtually everyone has lied to her as she discovers step by step the secrets her grandfather has left her with. I absolutely loved the description of Gracier. This small town sounds truly amazing (it reminded me a lot of the life in Stars Hollow from Gilmore Girls). Milissa created such a lovely and adorable setting for her novel. I loved this tight-knight community. It took me a few chapters to fully get into the story and to get to know all the characters (there are quite a few of those). I thought the way all the secrets unfold is very well illustrated. I was guessing along the way how the story would unfold (but I was wrong on certain accounts…). I love a book that keeps you guessing to the end. It all starts when Jessica's Grandfather Jonus dies and Jess discovers a lot of things that her Grandfather had kept from her. Jess agrees to move back to her home town of Gracier and take over the veterinarian practice her Grandfather used to run. After much digging, Jess finally discovers the secrets that have been kept from her since she was born. Can Jess recover from knowing the truth and will she realise that it was all done to protect her. I couldn't put this book down! I loved the town of Gracier and all it's townspeople. This is an intriguing love story/mystery with lots of suspense. Everyone in this town has secrets and are somehow connected to the main character Jessica and her past. I had all sorts of theories while reading this book, but every time I thought I had it figured out, another curve or clue came my way. I can't wait to revisit Gracier again!!! This a great book to read. Bailey does an awesome job of writing her debut novel. It is full of mystery, love and heartache. Past secrets are revealed that could shatter the lives of some in the town of Gracier, Iowa. This book kept me captivated until the very end; I couldn't put it down. I would definitely recommend this book. I give it 4 stars. This book is amazing I highly recommend it to everyone. While reading the book, I felt like I was right there and part of the town. Milissa R. Bailey did a great job. I can't wait to read the next in the series. I really liked this book. It was one that grabbed your attention from the opening page. It is easy to read, and fun reading it, knowing the author came from my home town. I can't wait for the next one to come out. I won this book in a first-reads giveaway. Gracier grabbed me from the first page and kept me guessing all the way to the end. I couldn't put the book down and manage to read it in a days time. Needless to say I will definitely be getting the next installment in the series when it comes out. Good story, but....get an editor! Please! Outstanding. Thank you for bringing to life small town Iowa. Brought back memories of growing up. Congratulations on your first book. I look forward to your next novel. Milissa Bailey grew up among the rolling fields of rural Iowa, where she continues to live with her husband, and three children. In her debut novel she draws upon her rich knowledge of the Midwest as she welcomes us to Gracier, Iowa, a well-kept community with even better kept secrets. Readers are introduced to a cast of characters they will come to know, love and hate. Vivid descriptions, palatab Milissa Bailey grew up among the rolling fields of rural Iowa, where she continues to live with her husband, and three children. In her debut novel she draws upon her rich knowledge of the Midwest as she welcomes us to Gracier, Iowa, a well-kept community with even better kept secrets. Readers are introduced to a cast of characters they will come to know, love and hate. Vivid descriptions, palatable anguish, forbidden romance and touches of humor lend itself to the stories weaved in this idyllic setting. The small town of Gracier holds many secrets and those who have kept the truth hidden are about to discover that not everything has been laid to rest.